All things about the media, marketing, business, Japan and other musings by Mike in Tokyo Rogers. This might seem a bit strange, but since next week Sunday is Mother's Day, I thought I'd write this is for a select group of very (un-)lucky mothers (and their children) that I've met before... Perhaps, by knowing this story before this Mother's Day, we will all be able to appreciate just how lucky we are and be just a tad bit more thankful for what we have. I've been doing some things to help charities for children with incurable disease and children with cancer recently. I think, from these experiences, I keep getting a sad memory flashing back in my head and that flashback really bothers me. It's the memory of something that happened a few years ago. I'd like to tell you about it and, hopefully, with that, I can do something to get rid of these recurring thoughts in my mind. Before that, some short background: My own daughter recovered from what was diagnosed as incurable cancer when she was a little girl. In spite of that, she recovered; but not fully. She is still wheelchair bound. Nevertheless she is the happiest kid you could ever meet and just entered university one month ago. She loves it. During the nearly two years she was in the hospital, I saw many kids and their families; many kids who didn't make it. Many kids who the doctors gave up on and sent them home to hospice to die in peace with their parents at their side. Because my daughter recovered I have always been eternally grateful. How wonderful it is for children to be be accepted as "one of us" by their peers. People probably don't realize how much of a treasure that really is! After she recovered, I decided to pay back to God and society by volunteering every year. One thing I do is volunteer and dress up as Santa Claus and visit sick, some terminally, children at various Children's Hospital's in Japan every Christmas. (Please refer to: Santa Claus Visits Tokyo Hospital for Children With Incurable Diseases). It was at one of these hospital's that I had the glimpse of the event that has bothered me greatly and will always bother me until the day I die, I suppose. 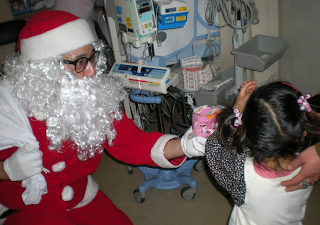 I was dressed up as Santa Claus and visiting a hospital in Tokyo that particular year. I had visited already a hundred or so children when I walked into the Intensive Care Ward. Upon visiting many kids there, I walked into a private room. There I saw a mother and her baby who looked to be about 2 months old or so. The baby was lying still on the bed and the mother standing on the other side, opposite the door. The hardest part is to not cry in front of these wonderful children who have been struck with incredible bad luck and a terrible illness. When I entered, with a "Ho ho ho!" The mother looked up to me and our eyes met. She looked straight into my eyes and I looked into hers. Time froze for a brief second. I had an epiphany. I had a revelation and manifestation of the essence of this woman's life flash before my eyes; not only was that her baby dying on the bed, it was part of almost her entire life dying on that bed. She burst out into tears. All her life she was dreaming of becoming a wife and a mother. All her life she was dreaming and waiting for the man who would come along and sweep her away. All her life, since a tiny little girl, she was dreaming of having a child. Since she was a little girl of 4 or 5 years old, she had that dear baby who was laying on the bed. She played with that baby, as a toy doll, when she was a small child. She had even named that baby when she, herself, was still just a little girl. When she first met her future husband and fell in love, that baby was already born in her head. She saw the baby and visualized all the wonderful times they would all share. The baby would be born and she would be so proud. Her parents and family would be so happy and thankful to god that this special child, this gift that she had been waiting for, planning for, all her life had arrived. This darling baby that would be born and grow up into a little boy or girl and then go to school and play with the other kids; this child who would grow into an adult and then repeat the cycle and then mom would become a grandmother. It soon became apparent and, against all hope and prayers, at the hospital, this darling treasure would be diagnosed with an incurable illness. All those dreams dashed on the rocks: No first shoes; no kindergarten; no elementary school; no dentist appointments; no birthday parties; no family vacations; no family dinners; no high school; no first dates; no dances; no college; no marriage; no babies (grand children) being born; no intimate hugs and mom-to-child talks; none of these things. Everything, all those dreams, gone. One of the dreams was baby's first Christmas... And, of course, that first Christmas dream was celebrating at a warm home with loving parents and family and friends. Santa would visit at home and climb down the chimney for the little child. That's the way it is supposed to be. I wish and pray to God that I am not a part of any first Christmas for any baby and mom at any Hospital for Children with incurable diseases or terminal illnesses again. But, I know I will and I know that I must. If there is anything at all that I can try to do to bring even one minute of happiness to these people and children, I pray that God gives me the strength to help. 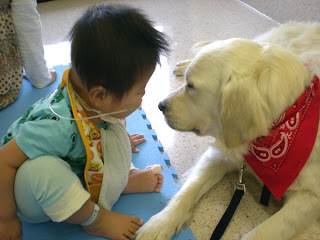 Recently, I found a new charity that I think is doing a wonderful job for children with cancer. It is called Shine On Kids. Shine On Kids have all sorts of wonderful support efforts for kids and their parents to remain strong and positive. One of my favorite things they do is a dog named Bailey as part of their "Facility Dog" program. Bailey is the most wonderful and gentle dog you could ever hope to meet. Bailey goes to children's hospitals and gives children something to look forward to everyday. Barney "speaks" to these kids. Trust me, I speak from experience; the best and most powerful medicine for curing cancer is having a positive attitude and something to look forward to. Tell them Mike sent you. Mike, Thanks for sharing your story. I checked out Shine on Kids and it looks like a really good organization. I'll be in Tokyo this Summer and would love to spend some time volunteering with them. Thanks for bringing it to my attention! Boy, you can tell a story! Yours is a sad story, repeated many times in countless, unsung cases. But I've seen others: parents of handicapped children who didn't die and live on, every day needing help to feed themselves, dress themselves, go to the toilet, brush their teeth, in some cases even to stand up or sit down (those that can). I've seen puny mothers lift their teenaged sons bodily out of cars and into the hospital. And they do this on a regular basis. No-one praises them. Many have to do it alone because the husbands take one look at the handicapped baby and say "Divorce". The parents do this day in, day out. For decades. Many develop a tough attitude with a big dose of humour. Some can't handle it, and whither away. Let's hear it for the unsung heroes and heroines. Yes, about the divorce. I was told by a doctor that when a child gets cancer, "Well over 70% of the families wind up in divorce." The pressure is just too great. Damn you are a good guy at heart. what is it your daughter wants to do when she graduates? 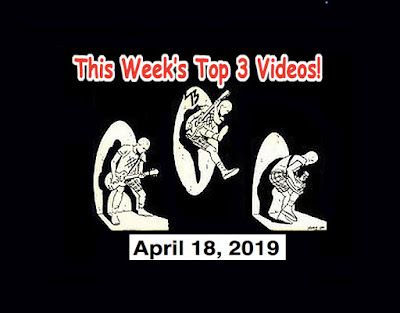 The Top 3 Video Countdown for April 18, 2019! The Peawees, The Tomboys, Rochelle Vincente Von K, Pup! The Best Children's Sports Park and Obstacle Course in Tokyo! Jyoubachi - Japan's Best New Rock Group? Professional music/TV/radio/anime-related program producer. In the music business since 1977 as lead vocalist with legendary Los Angeles Punk Band, "The Rotters" (Sit on My Face Stevie Nix.). Former assistant to the legendary Rodney Bingenheimer (Rodney on the ROQ - KROQ Los Angeles from 1980 ~ 1981.) First and only foreigner in Japanese history to become the General Manager of a major Japanese broadcasting station (TV Tokyo owned InterFM). Has produced a few smash hit programs and several of Japan's highest rated and most famous radio programs - as well as his fair share of crap. Recent Smash Hits were "The TV Show" (Set Program with "Ninja Slayer") which, between April - Oct. 2015, garnered over 10 million viewers. Currently producing and hosting "WTF?" the smash hit Sunday live show on InterFM 89.7 Wrote and produced full-length motion picture "Ghostroads - A Japanese Rock and Roll Ghost Story" which was released by a Japanese major motion picture company and in theaters all across Japan in Oct. 2017. Feng Shui Means, "Make More Money!" I Must Be Bitcoin's Bad Luck Charm! Close Encounters of the Third Kind in Tokyo? Click here for a comparison of current radiation levels and pre-quake levels in Shinjuku, see here for water.